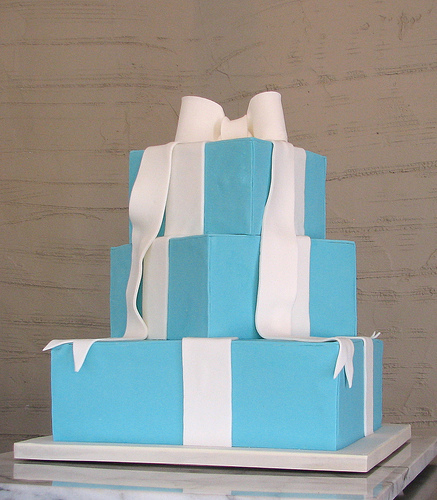 The sky is the limit when it comes to cake sculpture. 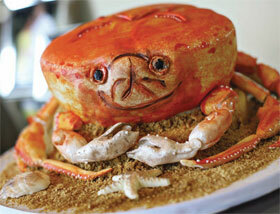 If you can describe it, or produce a photograph of it, then chances are your talented baker can turn it into cake. 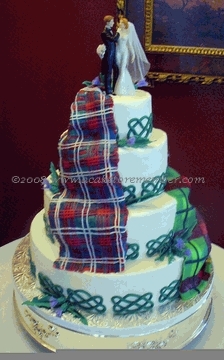 More and more, we are seeing real life objects cakes, or sculpted cakes as they are sometimes called, served in tandem with a traditional wedding cake. 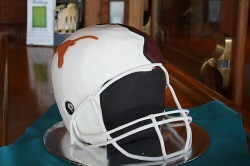 Normally, the sculpted cake is the groom’s cake, and can be fashioned into any number of objects: a beer bottle, a football helmet, a movie theatre. Gun case with a semi-automatic nestled in the foam-made-of-cake? No problem. Crab cake that looks like a crab? Easy peasy. Caffeine addict you’re baking for? Well then, why not a giant coffee cup? Sand castle? Child’s play. If you can dream it, it’s likely that your baker can do it. So free your mind. And your cake will follow. This cake is so simple, yet so beautiful. Smooth frosting accented with bright butterflies flying up to a birds’ nest. 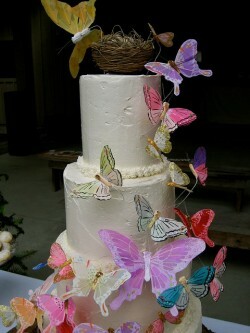 The natural feel of the cake extends to the “cake stand,” a wood round that was harvested by the groom and his father! After a long weekend filled with work, work and oh..more work I want to start this week off right. With a little quote of inspiration from one Holly Golightly. 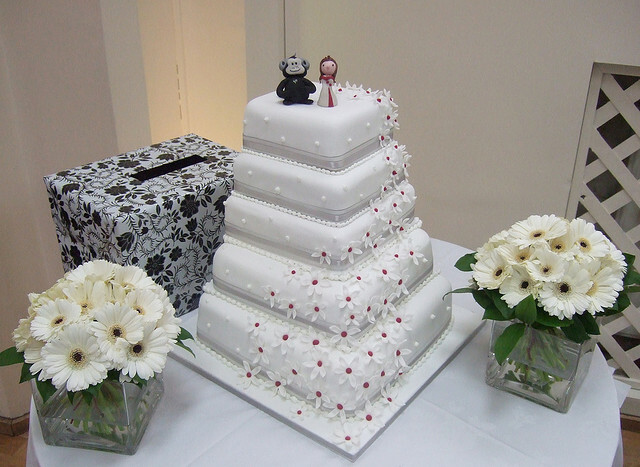 We’re ranging far and wide this week to bring you the latest and greatest in all things sweet to eat – and otherwise – about weddings. 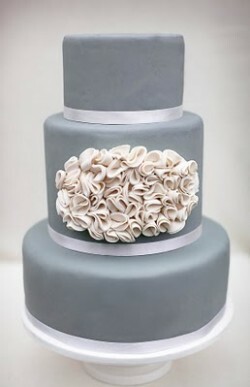 Kara Buntin of A Cake to Remember of Richmond, Virginia, has created my Dream Wedding Cake. 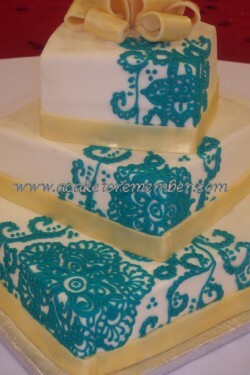 What is it with me, wedding cake, and chick flicks featuring Julia Roberts? But here we go again. Welcome to A Wedding Cake Blog’s first Sunday Round-Up ever! Here, we plan to give you some interesting tidbits to snack on, as we review fun things that have happened in the world of wedding cakes this week. So you meet that wonderful man…the man of your dreams. You fall madly in love. There’s just one problem: He went to University of Texas – and you went to Texas A&M. 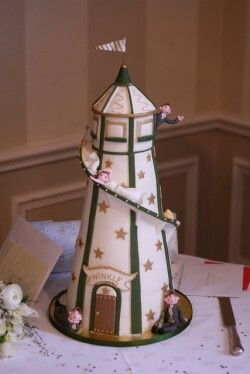 Another themed cake we couldn’t resist! 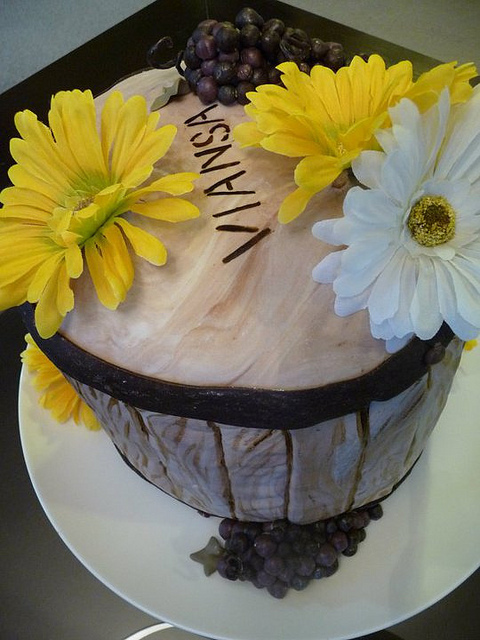 This wine barrel cake showcases a rustic flavor with marbled fondant replicating the look of wooden panels! 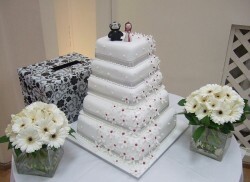 I couldn’t resist the daisy flower waterfall on this simple, square cake. The rest of the piping is gorgeous and I love the ribbon surrounding the tiers, but it’s those gorgeous flowers flowing down the side that really make this one for me.